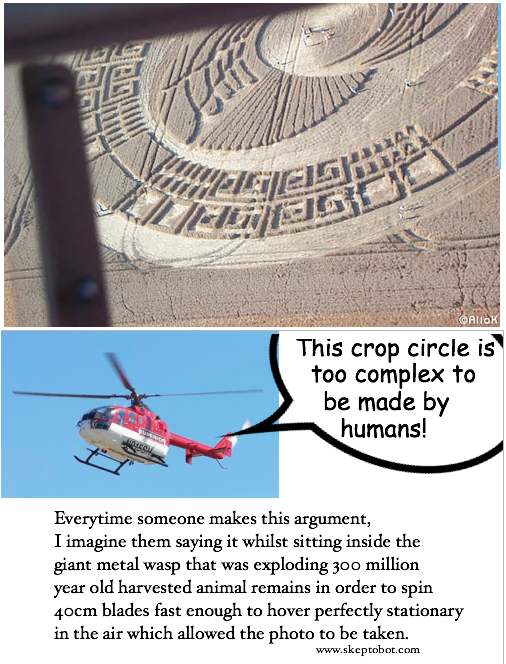 The standard argument for crop circles is so preposterous that it borders on a straw man — that they are too complex to have been created by humans. 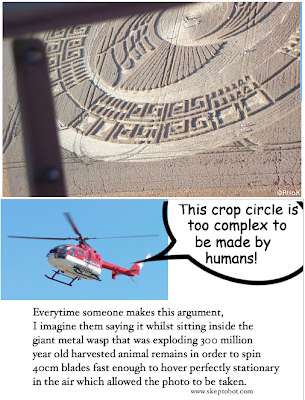 The fact that crop circles are almost always documented by ELECTRONIC EYES being wielded by people flying inside GIANT HOVERING METAL BUGS so that the believers in humanities inadequacies can talk about them via A HUMUNGOUS INTERCONNECTED NETWORK OF MILLIONS OF TURING COMPLETE MACHINES is rather conviently forgotten. Hence this little comic. EDIT: This image is currently the top post on skeptic board over at reddit. Here is the comment thread which includes some great discussion on what oil is made from. I will be needing to update my pic I think. You've no doubt noticed the complete lack of action by myself here on the site, or on Twitter. Real life has not been kind recently and so I've not been left with any time or energy to write. The cause of this absence would make a good post in itself, but I would rather wait till events settle. I've always tried to hold myself to high standards on this blog, but at the moment that means writing nothing at all. So I'm trying a new approach. I will attempt an update every sunday or monday - but it can be as silly and throwaway as this one. Better than nothing I guess?